One needs to work off all these high teas, so I timed one of my trips back home last year with an open water swim race back in Sydney – a mecca for open water swimming, or as we call it “ocean swimming”. It’s pretty big in Ostraya. Sydney is where I did my first open water swim race back when I was a wee uni student. I went along to a beach race on my own having decided to enter it without ever having done an open water swim ever. I’m not really sure what possessed to try open water swimming given that I didn’t really grow up near the beach. My first ows race was the Cole Classic – a then-2km swim from North Bondi beach to South Bondi beach (and back?). They have since moved the Cole Classic to a different beach. I’m glad I got to swim the original Cole Classic swim at the iconic Bondi Beach before they changed venues. One of the things I’m really looking forward to when I come home (on a permanent basis), is all the open water swim races available in Australia. We have quite the ocean swimming scene, and a lot of beaches and races I’d love to swim. So I’ve got that to look forward to. 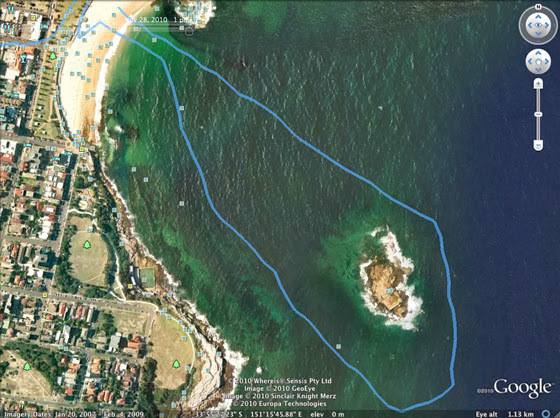 One of my bucketlist swims has been the Coogee Island Swim Challenge aka the Wedding Cake Island Swim, and I got to tick this off last November. This particular swim is pretty popular. They actually hold it twice – once in November (beginning of Oz summer – the cold water challenge) and again in April (end of Oz summer – the cool water challenge). The difference is degrees. The last Sunday in November last year was a beautiful sunny clear day. Water temps about 19 degrees, but air temp was in the low 30 degrees. 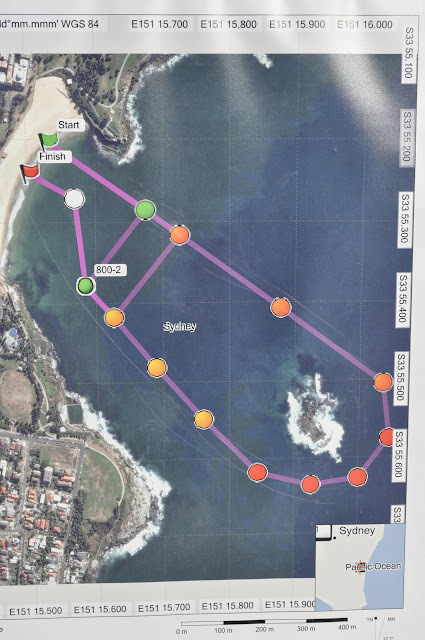 The race was at Coogee Beach and it’s a 2.4km swim from the beach out and around Wedding Cake Island and back inland. Wedding Cake Island is a rocky reef. The crashing white waves over the top of it makes it look as though it’s icing…hence Wedding Cake Island….I think. It is a challenging swim. Conditions can be tough. And in some previous years, they’ve had to change the course bypassing the Island loop….which kinda defeats the challenge of this swim. From the beach out to Wedding Cake Island, around the island and then back in. A big turn out for this race. About 800 people or so, with wave starts – mixed gender by age group. Ocean swims in Oz are very different to those in Japan. In Oz, you have to deal with waves and the surf. Most swims in Japan are very flat and tame. It’s nearly my turn to swim. I was a little disappointed that the race-issued cap didn’t come with a race-feature logo. They often make a nice memory-sake. I keep all my swim caps from races. Now, I thought sharks would be my biggest worry because the swim involves going out further past the shark nets. And I have actually done a training swim here and seen a wobbegong shark here at the beach before. I saw this “thing” at the bottom of the water, and it wasn’t until afterwards I was told that “thing” was a shark. Argh freak out. Ignorance is bliss. Kinda glad I didn’t know it was a shark whilst swimming over the top of it. Turns out on race day, my biggest problem was the gazillions of jellyfish I would be swimming through. Never have I seen so many jellyfish. Gah, my worst nightmare. I was nearly going to pull out of the race because I was not coping. They weren’t the stinging kind, but every hand stroke through the water, you felt them. They gave me the heebie jeebies. They were kinda going in my cosies. And made very sure to keep my mouth closed in the water. There were so many jellyfish that it got to a point where I refused to put my face in the water and basically was swimming freestyle with my head above water. You don’t really ever see the island at any point even though you swim around it. I had been told that one should take a look at the reef island as you swim around, but even then it’s hard to catch a glimpse of. I was too preoccupied with jellyfish. I felt only a sense of relief, not a sense of accomplishment when I finished this race. A time of a flat 51 minutes for the 2.4 km swim. So so slow. But glad to have just finished considering this is a race that I was prepared to pull out of. I should add, that my dad also entered this swim. His longest open swim distance race and was only a few minutes behind me time-wise. I need to lift my game! (I came 523rd out of 822 people. Was 134 out of 248 females. And 33rd in age group. Not great stats). Although I am glad to have finished, I can’t even say it was an enjoyable swim really. The jellyfish really bothered, even though no one else there seemed bothered by it all. It was a beautiful day though. The sun was shining, and I survived the swim. So win-win. It was nice to enjoy the scenery. Bucketlist swim complete. Got a few more up my sleeve though. The best part about finishing is eating. And I have to say, a good ol’ Aussie meat pie beats a Japanese onigiri as a post-race snack anyday! Look how clean and clear the water is. You can see Wedding Cake Island to the right of the photo. And to think I swam out there and back! Coogee Island Challenge – complete! Got a heap of merchandise – the hoodie and the towel to commemorate.